"It doesn't make any sense..."
"It does, actually, but in a perverted way." REPUTATION NOTE: This DMOD is one of the select group to have a rating of 9.0 or better (9.0) on The Dink Network. 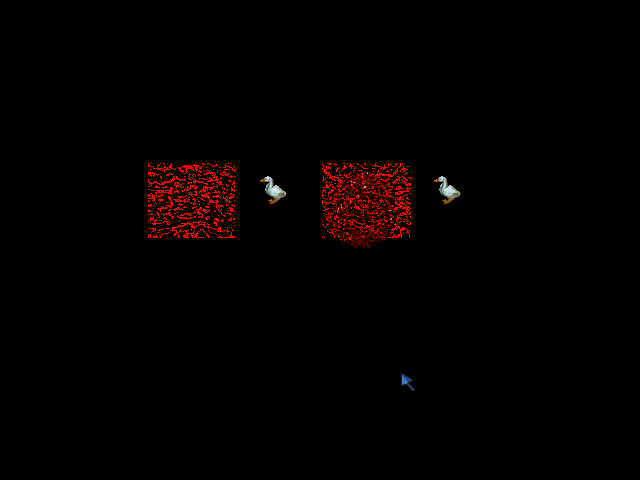 So it goes like this: this is... what I'm going to call a 'reimagining' of redink1's (Dan's) 1999 DMOD "End of Time" in order to make it better follow FIAT, which was intended to be a prequel to EOT in the first place. These two DMODs were intended to be part of a longer series that had a variety of names. 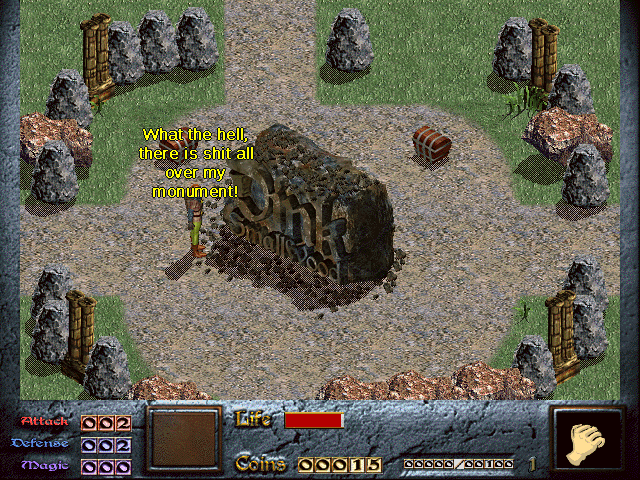 Some time after this release, Dan changed his mind about the "Dinky Dimensions" title. He decided to call the series "Ancient Legacy." Part 5: Hidthspace Revolution (Epic, probably)"
"Hey," I hear you saying, "that first one sure sounds familiar." That would be because it actually came out in 2004. By then, the name of the series had been changed to "Cast Awakening." The links between them were not meant to be all that direct, however. And that was all. Incidentally, if you want to know the real history of the Dink community from somebody who was actually involved in it instead of my fuzzy and often inaccurate take, go read through the Recondite posts if you haven't already, especially starting with the ninth one. You can learn about things such as the Dinkanoid high score "scandal" (maybe nobody actually cheated? ), JVeenhof's fake death, and more. Oh, Dink World - that was the name of the site where the anon war happened. That's what I was talking about way back in the Gnug's attack writeup in the 1999 topic. What a tangent! I've been lead astray in regards to this DMOD: I've been told that it's basically the same as the 1999 mod. Actually, the two have very little in common! This one is longer and better than the original, so you'd expect that it has lots of content that the other version does not; however, the original also has quite a bit of content that you don't see here either (no insane farmers demand spam here). For much of the DMOD, the experience feels totally unrelated, and the only part that really feels a lot like the original is near the end. I feel comfortable regarding the releases as two separate DMODs. EOTv2 has some of the same touches of presentation that were present in FIAT, like redink1's crazy exploding-ducks logo and an unusual title screen. 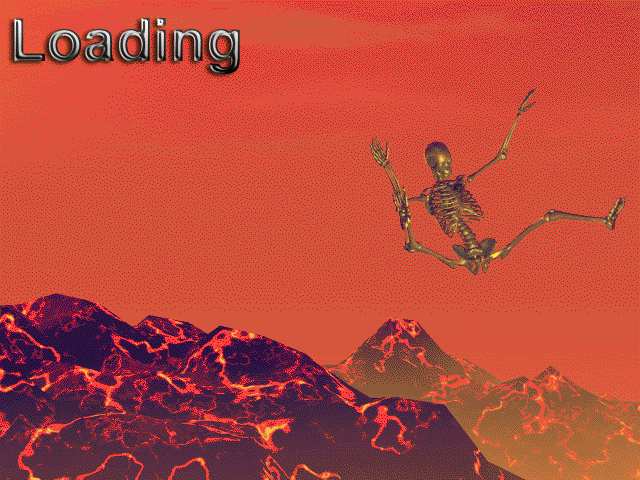 Take a look at this loading screen too. Nasty. 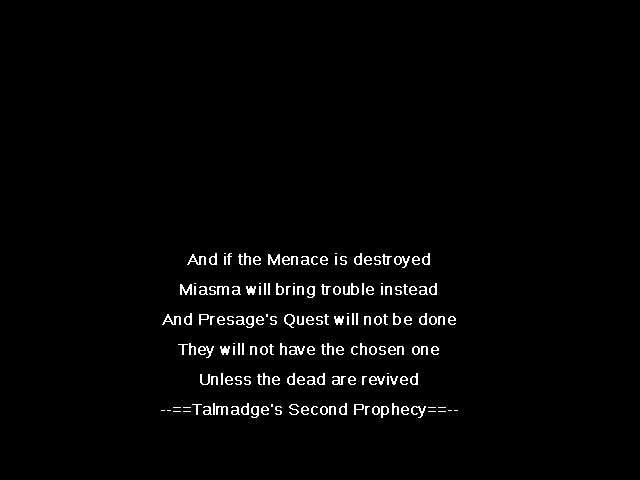 Oh, and Tal drops some more prophecy on us. Foreshadowy. Since this is pretty much a brand-new DMOD, it's impressive that redink1 managed to finish it so quickly. It does feel rushed in places. There are plenty of doors and other objects Dink can clip behind, and some fatigue from just having made FIAT shows in the fact that there aren't a lot of objects that respond to the talk command here. There's even a sign that doesn't say anything, which is always a bummer. 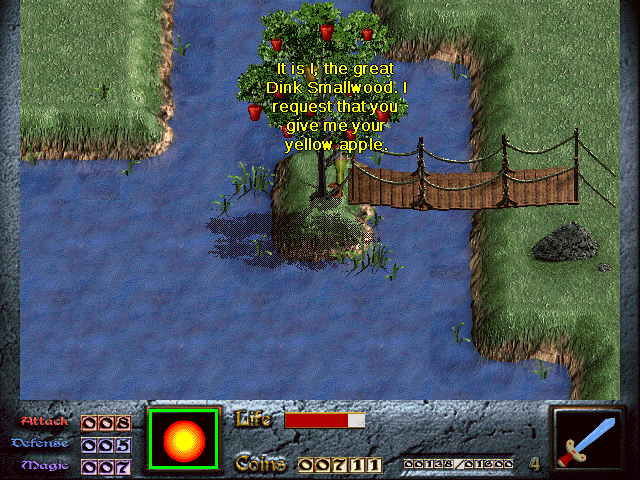 Whereas the original EOT started in the area where Dink can buy the flame bow in the main game, this version begins in Windermere. 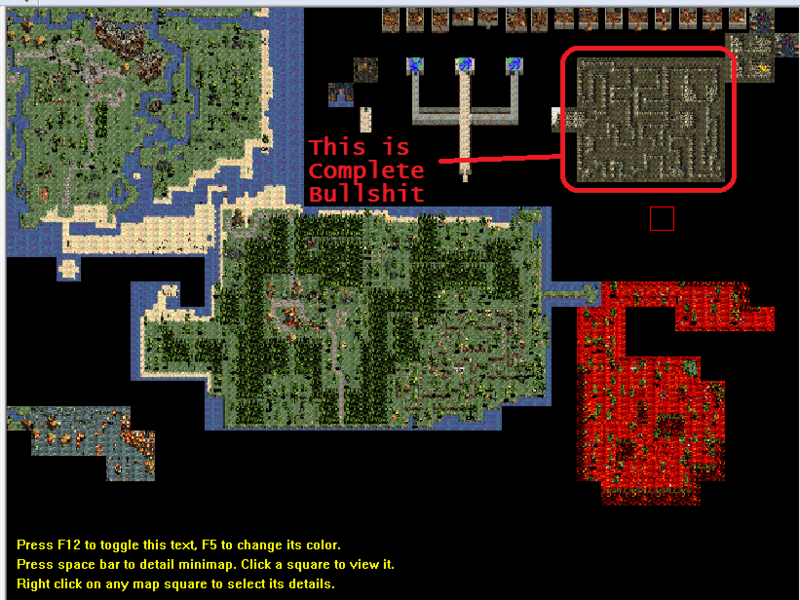 About the first third of the DMOD takes place there. It was nice to spend a little more time in Windermere, although the town seems to have let some things go. On the other hand, that talking tree finally does something! Hooray for that. The flame bow guy is still in the same spot, and you can find a secret stash of money to afford one, but since this mod lacks Bow Lore, it's utterly useless. I did a lot of walking in this one, and it did get a bit dull at times. It's not anything like the original, though, which required you to walk all the way back and forth with the bomb machine several times. Ugh, that sucked. There was a memorable segment where Dink hallucinates a blood-red world, where he fights and kills Seth, Milder, and his own mom, all of whom are already dead. Apparently this dream is supposed to somehow communicate the future, but I didn't get it. Still, it got my attention. I am in favor of weirdness. For most of the DMOD, I had a pretty fun time, but there's a really awful segment near the end that drove me crazy. 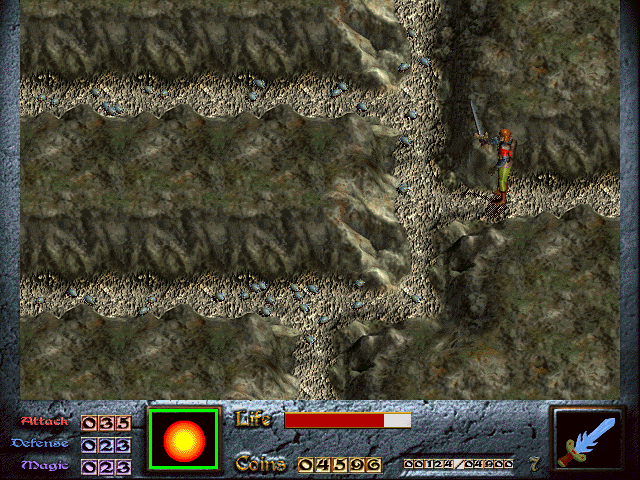 Dink has to navigate a cave maze filled with tiny pillbugs. You have to stop and slowly, torturously chop them all down as you go. This is made worse by the fact that if you have to double back for some reason, they'll all be back! The maze is also infuriatingly huge and really tried my patience. Seriously, take a look at this. I'd like this one a lot more if you simply cut this segment out. 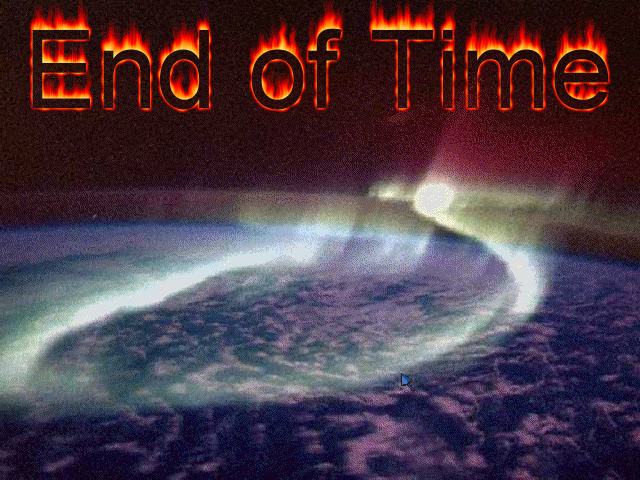 As in the original End of Time, Dink ends up accidentally destroying the town of Windermere, which the mod really lingers on this time. It was already dark the first time around, but the fact that I had just spent a third of this very mod hanging out in Windermere made the loss more immediate to me. 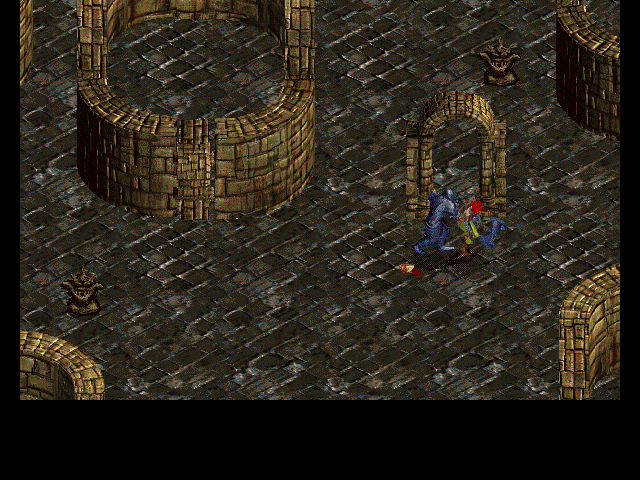 The characters who perish are characters in this story and not dimly remembered ciphers from the original game. I have to confess, it put a bit of a lump in my throat. In the 1999 version, Dink is sentenced to life imprisonment for his crime. Here, things go even worse. Without Dink, the world is left at the mercy of King Daniel's evil brother, and the story ends. Obviously, the never-produced final part of the story was to involve Dink being resurrected in some way (sounds familiar). In its absence, though, I guess this stands as the ending of the Redinkiverse. It's a bit of a rushed effort, but it's still a pretty solid DMOD and way more than I was expecting from a remake of End of Time. 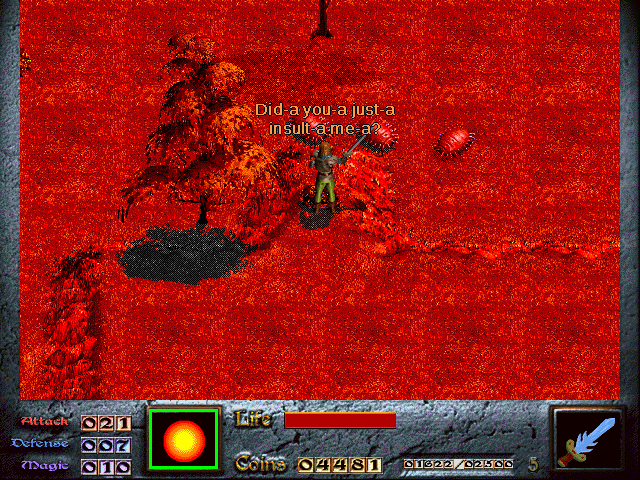 If I ever play it again, though, I'm cheating past the dang tiny pillbugs.